Observing a snail crawling around, the view is immediately attracted by its head, orienting itself in its surroundings using the tentacles. The snail feels its environment, touches an obstacle and withdraws the tentacle. 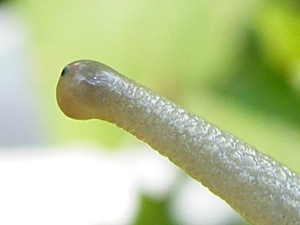 The snail can move its tentacles separately and by closer observation it reveals an eye on each of the larger tentacles' tips, recognisable as a small black spot. Apart from those larger tentacles, the snail also has two smaller ones under them usually pointing towards the ground. Beneath those also the snail's lips can be seen, covering the mouth opening. That snails have head to carry their tentacles at first appears trivial. But it is not at all among molluscs. Several of their groups, such as the clams and mussels (Bivalvia) and elephant tusk shells (Scaphopoda) do not have a head. Snails, moving around to a greater extent, have more advantages in having one: Sense organs can be concentrated in the head. On the other side, clams and elephant tusk shells usually move little, so they do not need a head. Clam species, such as the file clam (Lima hians), atypically able to swim freely in the water, have also developed tentacles. Only as clams do not have head (bivalves are also called Acephala, the head-less molluscs), their tentacles protrude from the mantle rim. A Roman snail's eye stalk. Picture: Martina Eleveld. In gastropods, on the other side, tentacles are a part of the basic construction plan. So all gastropods possess tentacles, but they have evolved to very different forms. Two pairs of tentacles, as we know them from the Roman snail, only terrestrial pulmonate snails (Stylommatophora) have, the Roman snail being one of them. Also having eyes at the tips of the tentacles is far from common among snails. The terrestrial pulmonate snails, however, do have this in common and it also supplied them with their scientific name: Stylommatophora means "stalk eye snails". New Zealand mud snail (Potamopyrgus antipodarum). On the other hand observing a water snail, looking more closely the eyes can be seen at the tentacles' base. Besides, the snail only has one pair of tentacles. Many sea living gastropods, however, do have eyes on stalks, so the snail can look from under its protective shell without having to extend its head. So the assumption is allowed that the second tentacle pair has developed later as eye stalks and that the distinctly long eye stalks of terrestrial pulmonate snails are a special adaptation, allowing for a larger field of view. The examination of a snail's eyes will yield the result that at least terrestrial pulmonate snail eyes are quite far developed. They even possess a lens so the snail certainly is capable of seeing pictures. Alas, it does not possess enough types of light sense cells, so it cannot see colours. Besides, there is no ciliar muscle, so the lens cannot focus. As a consequence, in spite of the high evolutionary level of their eyes, snails cannot see very well. Which makes their tentacles even more important for their orientation. Contrary to the eye stalks, a snail's shorter tentacles almost always point to the ground. They are mainly used for olfactory orientation: Sense cells on the tentacles' surface give the snail a picture of its environment's smell and also help in the search for food. More recently it has been found out that snails also attract mating partners by olfactory hormones. So the small tentacles also help in the search for a partner. During mating, Roman snails touch each other frequently with their tentacles, which might also serve to better smell the hormone. There are also olfactory sense cells on the longer tentacles. Observing how a Roman snail uses its tentacles, another property of those is easily seen: The snail is able to withdraw its tentacles, if it touches an obstacle. And it can do so separately. Each of the snail's tentacles is equipped with an own withdrawing muscle, the retractor (picture on the right, 2). If the snail contracts the muscle (4), the tentacle is withdrawn and like a glove's finger, disappears inside the head (B). Especially in juvenile snails which still are quite transparent, the eye (1) can be seen as a black spot moving inside the tentacle. 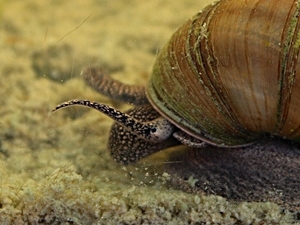 To extend the tentacle, however, the snail cannot use the muscle. To do so, it has to press blood fluid (haemolymph) into the tentacle (A). A special case are some terrestrial pulmonate snails, which appear to have not two, but three, tentacle pairs. 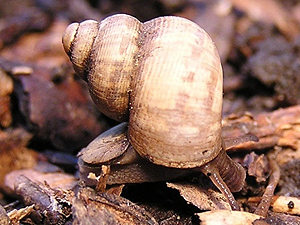 A wolf snail (Euglandina rosea) for example uses this third pair to examine the ground. To understand this, one should know that the wolf snail, living up to its name, is a predator hunting other snails, following their scent along their slime trail. It could be said the wolf snail "sniffs" for its prey. The third tentacle pair are the wolf snail's extended lips, also equipped with numerous olfactory sense cells. Not all predatory snails have those extended lips, but among those, which do, are the wolf snails mainly occurring in Central America, as well as the African predators of the Natalina genus (Rhytididae family). 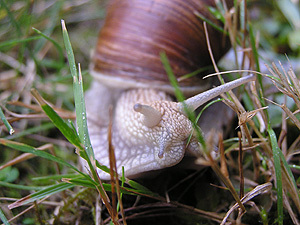 A predator snail without extended lips is the Dalmatian predator (Poiretia cornea). Also, the European shell slugs (Testacellidae and Daudebardiinae), in that regard, look like all other terrestrial pulmonate snails. The picture on the left, once again, shows the three tentacle forms of snails mentioned before: Two tentacle pairs in the usual terrestrial pulmonate snails, like the Roman snail (Helix), and the extended lips of predator snails, such as the wolf snail (Euglandina). Like mentioned before, water snails only have two tentacles, which, besides, they cannot withdraw. The round mouthed snail (Pomatias elegans) (C), however, is not a water snail, but a terrestrial one. But it belongs among the smaller part of those species that are not terrestrial pulmonates. It is more closely related to marine gastropod groups, in this case the periwinkles (Littorinidae). Like them, and different from terrestrial pulmonates, it also carries a shell lid (Operculum) on its tail end, closing the shell mouth when the snail withdraws. Other groups of operculate terrestrial snail groups, for example, are the needle snails (Aciculidae) and the Cochlostomatidae family. Tridentate horn snail (Carychium tridentatum). A third group are the tiny thorn snails (Carychiidae). They are related to the coast snails (Ellobiidae) and they have no operculum, but also but two tentacles, the eyes at their base. In contrary to the large number of species in the very adaptable terrestrial pulmonate snails, the latter groups have remained quite few in number. To return to the water snails, on one hand the pulmonate water snails should be mentioned. Those do not have a shell lid (pulmonate snails never do), but only two tentacles. 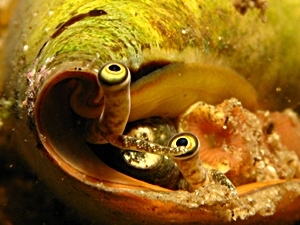 As their eyes, as previously mentioned, are situated at the tentacles' base, those snail groups consequently are called Basommatophora, base-eye snails. Water pulmonate snails' tentacles can be quite different in appearance. While ram's horn snails (Planorbidae) and bladder snails (Physidae) have long thin tentacles shaped like threads, pond snails' (Lymnaeidae) tentacles are short, broad and triangular. In contrary to that the snails breathing with gills can be seen, living in the sea and in fresh water. The so-called prosobranch gastropods have a shell lid and also separate sexes, different from the hermaphroditic pulmonate snails. Concerning their tentacles, especially the fresh water mud snails (Viviparidae) are interesting. transformed to a mating organ. 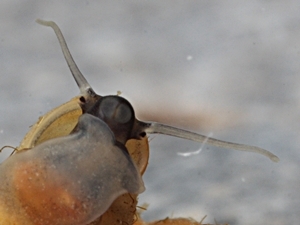 In male mud snails, the right tentacle has been transformed into a mating organ, which is why it is distinctly broader than the left tentacle. Florida fighting conch (Strombus luhuanus). Many marine gastropods are quite efficiently protected against the hostile environment, which includes other usually predatory sea snails. One example are the conches (Strombidae). 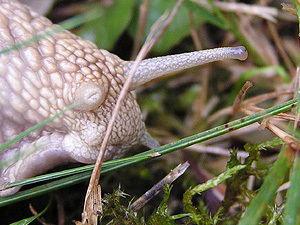 Their eyes are placed on short stalks, almost like in terrestrial pulmonate snails, so the snail can look from beneath its shell without having to expose the head (see above). Those snails also have the belligerent name "fighting conches", because they are quite capable of defending themselves using their sabre-shaped operculum. They also use it to jump over the sea floor. The marine opisthobranch gastropods (Opisthobranchia) finally have no operculum. They are also hermaphrodites, like the pulmonate snails and most of them are slugs. Many species have reduced their tentacles, but interestingly, many opisthobranchs have developed a new kind of tentacle: Above the original tentacles (if present) there are the so-called rhinophores. They often have an enlarged surface full of olfactory sense cells. This explains the name rhinophore ("nose bearer"). Sea hares (Aplysiidae) are called that way, because their rhinophores look like hare's ears. In the colourful nudibranchs (Nudibranchia) the rhinophores can sometimes be as intensive in colour as the dorsal appendages (cerata), which made those animals popular targets for underwater photographers. To finally return to the terrestrial pulmonate snails, amber snail (Succineidae) tentacles especially are important to a parasite infecting those snails. 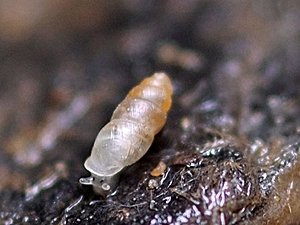 The distome Leucochloridium paradoxum infects the snails as a larva (miracidium) living in the water. In the snail's body it develops, reproduces and finally moves into the tentacles, where the large colourful sporocyste tubes make the tentacles swell grotesquely. As the snail now is rendered unable to withdraw its tentacles and also influenced to climb conspicuous water plant stems in plain sight, birds eat the snail's tentacles and are infected themselves that way - a process, which the snail, of course, pays with its life. Systematic classification of the mentioned groups (partly according to CLECOM). Herbert, D., Kilburn, D. (2004): "Field guide to the land snails and slugs of eastern South Africa", pp. 215 ff. on the Rhytididae family of carnivorous snails.